« Alive And Kicking: Has NY Wine Come Of Age? I recently received a shipment of wine samples from the critics’ darling Molly Dooker, which came with a handy set of instructions on how to perform the now-famous “Molly Dooker Shake.” The Molly Dooker shake is the arguably inelegant but certainly effective way to release the nitrogen that is used is bottling several of the Molly Dooker line of wines. 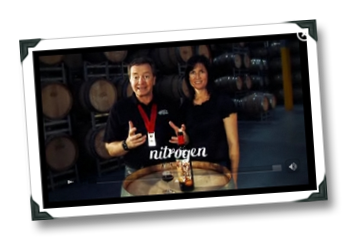 But I ran into some trouble when I hopped onto the Molly Dooker website to learn a bit more about why they use nitrogen in the winemaking process in the first place. Not technical trouble, but accuracy trouble. The accuracy trouble is that their explanation contains less truth than it does (as Steven Colbert likes to put it) truthiness. Exposure to sulfites in drinks and food can indeed cause a severe (and in very rare cases fatal) asthmatic reaction. But before you start pouring all of your fine wine down the sink drain, you should know that only 0.01% – 01.0% of the U.S. population is estimated to be allergic to sulfites (probably fewer than 1 in 100 people). If you’re even an occasional wine drinker, chances are that you’ve heard the rumor that sulfites in wine cause headaches. Despite being popular in the rumor mill, there is no scientific evidence to suggest that ‘wine headaches’ are caused by sulfites. In fact, if you do get headaches when drinking wine, chances are higher that the headache could be a reaction to any of several esters (flavor compounds) that occur naturally in wine. Chances are greater still that you simply have a hangover (so drink more water next time, my party-loving friend, or – egads! – drink less wine). Now back to the chemistry: sulfites are produced naturally during the fermentation process (so you probably are exposed to them in some beers, soy sauces, and other fermented liquids). The amount produced naturally is pretty small – anywhere from 6 to 40 ppm (parts per million). PPM is roughly equivalent to 1 milligram of something in 1 liter of water. Another way to think about it – 1 ppm is about 4 drops of ink in a 55 gallon barrel of water. Dangerous if you’re talking about arsenic, but not so much when you’re talking sulfites. U.S. government regulations stipulate that wines containing 10 ppm or more of sulfites need to display a warning on the bottle, in order to alert consumers that are allergic to sulfites. Since more than 10 ppm are created during fermentation, and given that the labels don’t have to specify the amount of sulfites the wine contains, that pretty much means every bottle of wine needs to carry the warning – effectively making the warning a bit useless and confusing consumers that may not be allergic to sulfites. Sulfites are also added during the winemaking process, which can up the ppm of the sulfites in your wine (the U.S. government allows up to about 300+ ppm). Why do winemakers do this? They’ve been doing it for hundreds of years – the first historical record of its use in winemaking is from a royal German decree in 1487 – in order to kill bacteria, prevent browning of wine form oxidation, and to help stabilize the finished wine. The 1487 decree specifies use of about 19 ppm of sulfer, which according to wine writer Hugh Johnson (in his Story of Wine) is an “improbably low” amount. Bottom line: sulfites probably aren’t giving you headaches; and if you had an allergy to sulfites, you are likely already on a restricted diet because many, many other food products would probably have almost killed you via a severe respiratory reaction before you ever had any wine. Thus endeth the diatribe, err, lesson of sorts. Arrgh, this is one of my number one pet peeves – people claiming they have a sulfite allergy because they get headaches from red wine! It's so not true, and I'm happy to read articles like this that help dispel the myth. Once when I worked in a retail wine shop, a woman came in and handed out business cards to everyone, promoting her anti-sulfite-in-wine website. I visited the site and it was full of propaganda, unverified hearsay and just basically a bunch of baloney. Whenever someone complains about sulfites, just ask them if they have ever eaten pickles, or dried apricots or frozen french fries. All of those contain WAY more sulfites than a glass of red wine. :) Mel – you are among friends here, trust me! I've heard and read that biogenic amines – second to alcohol, as you pointed out – are more likely the cause of a headache. A majority of these biogenic amines result from reactions associated with the ML conversion. If someone can link a definitive study, I'd be glad to read it. Thanks for digging, Tom! Like Mel, I tell people to try eating a dried apricot and see how that goes. If they don't have a problem with the apricot, then I suggest they seek out white wines that haven't gone through ML and see if those work for them. I'd say there's a little bit of "truthiness" at work here. Citing an article Published: April 13, 1988 to support "only 0.01% – 01.0% of the U.S. population is estimated to be allergic to sulfites (probably fewer than 1 in 100 people)" seems a bit "truthy." In addition, a person can be sensitive to a substance without being allergic to it, and an absurd abundance of such a substance could cause discomfort. I agree that Molly Dooker's unique approach is more a marketing scheme than a matter of health. I'm just saying that there seems to be a lot of "truthiness" both there and here. Hey Roberto – point taken, however at least I am citing a source, so I'd argue that reduces the truthiness factor by at leasta few percentage points :). While SO2 is necessary to protect a wine from oxidation and to kill off bad bacteria and yeasts it can also add strong off-flavors and I'm sure it dramatic affects a wine's development. A winemaker could speak more intelligently about this than me on this matter, but assuming a wine is clean and stable with decent pH, acidity and tannins, and if Nitrogen is truly effective, then I think it's a great alternative. Just because the official marketing line is not 100% accurate does not mean the practice should be written off entirely as a gimmick. Sam – no one is saying Nitrogen is a gimmick here. I happen to agree with your point. Well, just for kicks, you should read his article–it is in his book "It must have been something I ate." Me again, secondly, the issue of "sulphite headaches seems have to increased with the advent of additive labelling. IE the more people are made aware of the more they have to fear. The issue of headaches from wine consumption is related more to the volume of wine consumed than the wine itself. As alcohol is consumed enzymes in our digestive tract begin to oxidise the ethanol into acetaldehyde. Acetaldehyde is a common vasoconstrictor, ie it causes blood vessels to contract, particularly in the tissues surrounding the brain. The process of alcohol digestion also uses a considerable amount of water do it tends to dehydrate the victim. So the cumulative effect is elevated levels of aldehydes in the bloodstream. Ergo the key ingredients of a headache exist, ie presence of aldehyde, dehydration and increased blood pressure. This is of course not the only cause of a hangover as the literature is full of other agents such as biogenic amines (histamine is a classic) but it tends to be the primary cause. So next time you want to avoid a headache, drink a little less (but better) wine and a bit more water and you'll be fine. Oh and I agree Steingarten rocks! Thanks, Jeff – I need to be clear that no one is dissing nitrogen here (well, I'm not at least and that was never intended in my post); my beef so-to-speak was with the idea of sulfites causing headaches and therefore implying that this was a logical justification for using nitrogen. It's not, as you point out very well in your subsequent comment – sulfties cause a potential serious respiritory reaction in those who are really allergic to it; those headaches (again as you point out) are MUCH more likely due to dehydration, etc., than to sulfites. 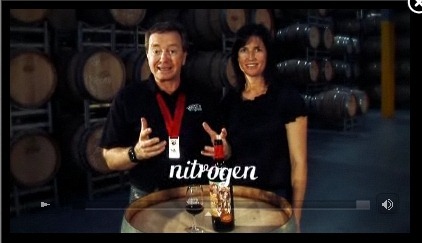 If Sparky just said "hey, we use nitrogen because we think it's better than SO2 for the following reasons…" then I'd have zero problem with that; I just don't like anyone (especially someone who makes award-winning wines that get a good amount of press) perpetuating the myth of sulfite headaches. I was going to add that the article wasn't about whether or not Nitrogen use is viable when bottling wines… but I'm already sick of writing that (see 800+ responses from me above :-)! This is an excellent post. Thanks for those links as well Tom.